Rain And Snow Coming Wednesday…So How Much Snow? Ever since late last week, we have been discussing the possibility of a rain/snow mix for Wednesday. Some models suggest precipitation tomorrow will be all snow, others suggest it will be a rain/snow mix, and a few say most if not all of the precipitation we get tomorrow will fall as rain. This will be a tricky forecast because temperatures will likely be near or just above freezing most of tomorrow morning and into parts of Wednesday afternoon. 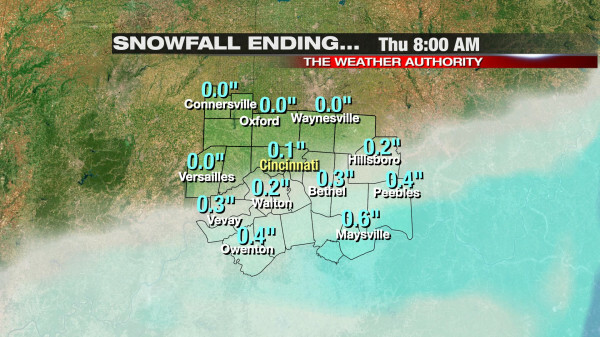 Powdery snow is unlikely Wednesday; in the areas that get snow, it will be very wet and slushy. Model guidance continues to have the best chance for precipitation south and east of Cincinnati tomorrow morning and afternoon. By late tomorrow afternoon, this slug of moisture will be pushing east in a hurry. 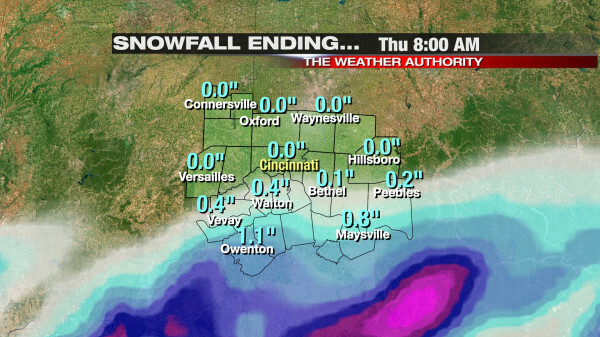 NAM and GFS runs from this morning give areas south and east of Cincinnati snow, and little to no accumulation elsewhere. This morning’s NAM run gives the far southeastern corner of the Tri-State 1-2″ of snow through Wednesday evening and little to no snow in downtown Cincinnati. This morning’s GFS gives the Tri-State little to no snow tomorrow. 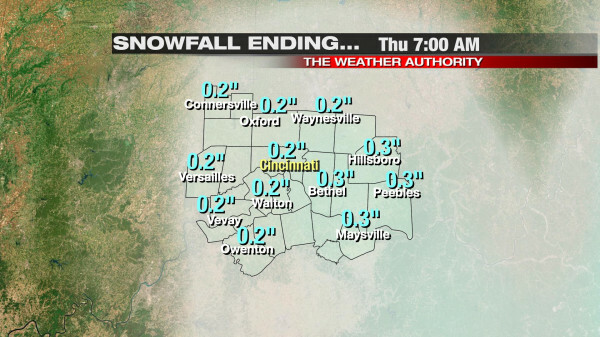 I think areas south and southeast east of Cincinnati get up to 0.5″ of wet, slushy snow Wednesday morning and afternoon. A lot of this snow will melt on contact, especially on the roads. Surface pavement temperatures in Kentucky and southwestern Ohio are in the 40s and 50s now; while these temperatures will likely drop some overnight, it will likely be too warm for snow to stick on the roads in most places- especially treated roads – tomorrow morning and afternoon. Air temperatures will also be above freezing most of tomorrow morning and afternoon, working against the possibility for accumulation. I’ll look over evening model data and update the forecast as needed!